Not one, but two versions of this wine exist, although the front labels are perfectly the same. 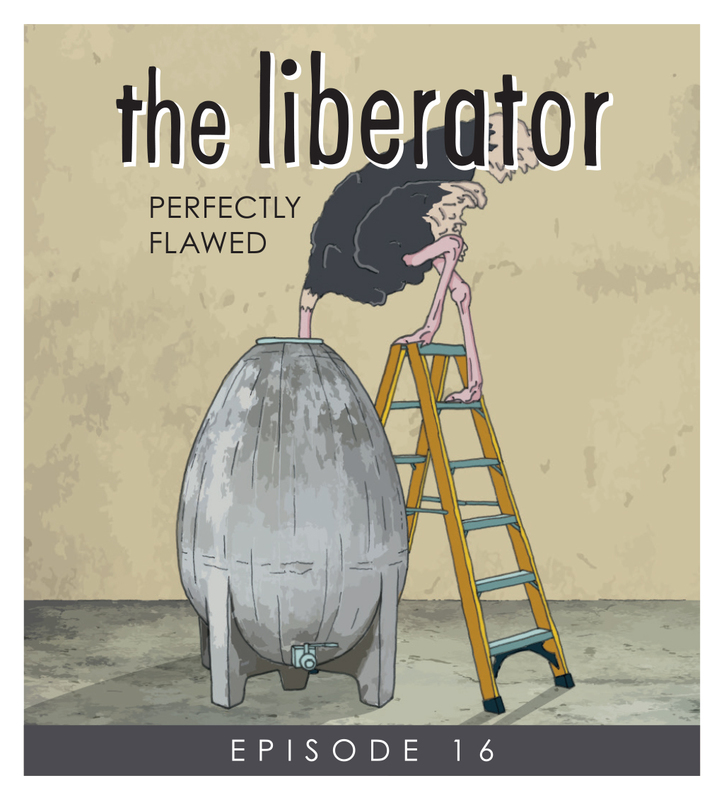 It also marks the long-awaited launch of The Liberator in South Africa. Until now, everything has been exported. It’s only taken Rick eight years to find the right opportunity to make this happen. 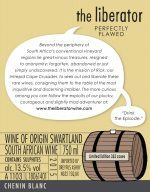 It was in May 2017 that our intrepid explorer was presented with an unlabelled bottle of wine on a regular visit to Tulbagh. It had been bottled sometime in early 2016, although only the previous incumbent winemakers of the farm know when. The wine was made and bottled under the radar, for ‘personal consumption’. It transpired that there were 330 bottles in the cellar. A Chenin Blanc fermented and aged in a concrete egg. By chance or maybe by design, the wine had developed a veil of flor yeast. It was distinctive and unique. Rick said: ‘I’ll take it’. Then news came that the wine technically didn’t exist. No paperwork – no Export Certificate. But, being the tenacious wine-buyer that he is, Rick didn’t give up there. 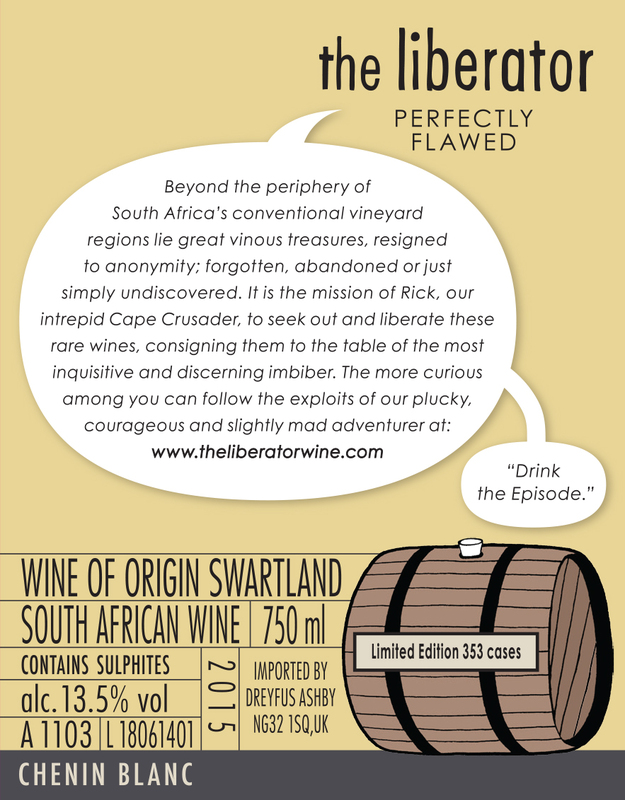 He might not be able to launch the wine internationally to an unsuspecting audience, but might this be the wine to embark on a South African crusade with…? It’s legal to sell such a wine in the domestic market, but without mention of cultivar, vintage or region. It then transpired that there was a second, larger batch still in tank. This wine was ‘on the cards’ and could be bottled and exported. So, this rather explains the story of the dual existence. 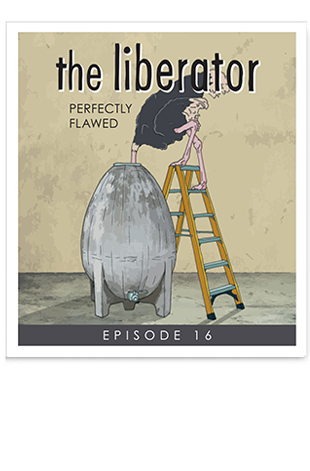 ‘Perfectly Flawed’ is an oxymoron of a wine. An ostensible self-contradiction. Like the label, it’s a wine that reveals itself to be a complete paradox. Outside of the Jura and the Jerez triangle, there are few wine regions in the world where Saccharomyces cerevisiae, the flor yeast responsible for the biological aging of Sherry and Sherry-like wine exist. The Cape is one of them. Enjoying the same 33 degrees latitude as Jerez, one can understand why the climate might be suited to flor-affected wines. Remember too that South Africa had a one-time colonial link with providing the Empire with ‘sherry’. Now the question Rick wants answered is which came first…? The ostrich or the (concrete) egg…?